Looking at the landscape, there are few products that target the same solid tumours but there is a clear trend in developing an immune primer plus TKI/CPI combination. 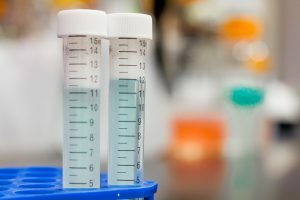 Two personalised vaccines are in development for RCC: Rocapuldencel-T (Argos Therapeutics), which is in Phase III in combination with sunitinib, but may have been abandoned due to failure at interim analysis, and NeoVax (Dana-Farber Cancer Institute), which is in Phase I in combination with radiotherapy. Tepodi (OSE Immunotherapeutics) is a synthetic long-peptide vaccine and is in Phase III for NSCLC. Imlygic and Provenge are marketed for other solid tumours (melanoma and prostate, respectively). Transgene’s oncolytic virus Pexa-Vec is in Phase III for HCC in combination with sorafenib. Viralytics’ oncolytic virus Cavatak is in Phase I for NSCLC in combination with the CPI pembrolizumab. The players active in the space are mainly small companies and universities. As with other IO segments, investors should expect this landscape to change significantly over the coming years as companies look for increased efficacy in a range of solid tumours in a wider range of combinations. Immunicum is a clinical-stage immunoncology company based in Gothenburg, Sweden. The company is developing an allogeneic dendritic cell immune primer for use in combination with tyrosine kinase inhibitors and checkpoint inhibitors in multiple solid tumour indications. Immunicum is a Sweden-listed, clinical-stage immunoncology (IO) company that develops allogeneic dendritic cell (DC) technologies. Its first clinical product, ilixadencel, is in Phase I and II combination studies in several solid tumour indications. Two studies are expected to report in 2019; the first is the Phase II MERECA data in renal cell carcinoma (in combination with sunitinib). Interim data from the Phase I/II multi-indication study where ilixadencel is being tested in combination with a checkpoint inhibitor are also expected in H219. We initiate coverage of Immunicum with an rNPV valuation of SEK1.13bn or SEK22.1 per share. Ilixadencel is an immune primer that uses activated DCs. It should not be confused with a DC therapy or DC vaccines. Immunicum’s DCs are allogeneic (from healthy donors) and, as such, induce an anti-tumour response. Injected directly into the patient’s tumour, their role is to attract and specifically activate the patients’ immune system to recognise and kill the tumour cells. 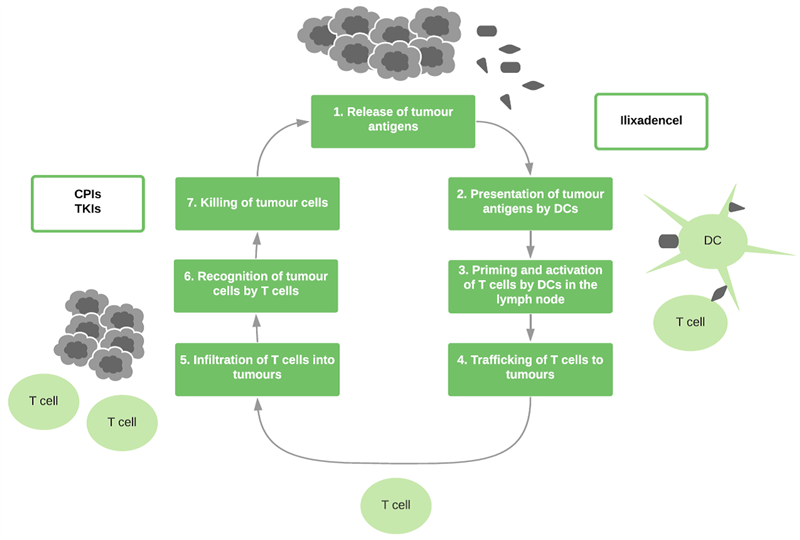 Ilixadencel is being developed for advanced solid tumours and combined with drugs known to inhibit tumour-dependent immune suppression at different points in the cancer immunity cycle. Recruitment is now complete and top-line data are expected from the ongoing renal cell carcinoma (RCC) Phase II (MERECA) trial (88 patients) in Q319. This could provide the efficacy signal that Immunicum needs to partner in at least RCC. In addition, the multi-indication Phase I/II study is starting later in 2018. This will test ilixadencel in combination with a checkpoint inhibitor (CPI), providing investors with two potential positive events in 2019. Immunicum’s recent rights issue resulted in a SEK168.1m cash position at the end of Q118. This is expected to fund Immunicum through the RCC Phase II to completion and the multi-indication Phase I/II trial to interim analysis, both in 2019. Immunicum’s market capitalisation is SEK324m, but our rNPV values Immunicum at SEK1.13bn or SEK22.1 per share. The first and second product launches for ilixadencel (RCC and NSCLC) represent 25% and 35% of our valuation respectively, with peak sales in those two indications (on which royalties and milestones are based) estimated at $1.4bn and $2.3bn, respectively. Immunicum is an IO company listed on NASDAQ Stockholm and based in Gothenburg, Sweden, that develops allogeneic DC technologies. The company was formed in 2002 based on research originally carried out at Sahlgrenska University Hospital in Gothenburg, Sweden. Immunicum is developing an ‘off-the-shelf’ immune primer (ilixadencel, formally Intuvax) based on activated allogeneic DCs and another ‘off-the-shelf’ vaccine technology platform (IMM-2) that generates projects based on adenovirus-transfected allogeneic DCs. Ilixadencel is in Phase I and II clinical studies in several solid tumour indications. It is based on Immunicum’s patented pro-inflammatory allogeneic DC technology. The company will develop and license ilixadencel as an immune primer in combination with tyrosine kinase inhibitors (TKIs) (sunitinib), the PD-1/L1 CPIs and the standard oncology chemotherapy drugs (including gemcitabine), in five solid tumour indications. The IMM-2 platform products are currently in preclinical testing. There are many different approaches aimed at enhancing the activity of CPIs in solid tumours that range from orally bioavailable small molecules, oncolytic viruses all the way to manipulated cellular therapy. Immunicum’s products are at the most innovative end of this spectrum and, as whole allogeneic cells, might be expected to produce the most vigorous immune response when injected into tumours. Our risk-adjusted Immunicum valuation comprises Immunicum’s cash plus the risk-adjusted royalty, milestones and a single up-front payment for ilixadencel in five indications: RCC (ilixadencel IM-201), hepatocellular carcinoma (HCC) (ilixadencel IM-102), non-small cell lung cancer (NSCLC) (ilixadencel IM-202), head and neck squamous cell carcinoma (HNSCC) (ilixadencel IM-202) and gastric adenocarcinoma (ilixadencel IM-202). We assume that the first ilixadencel indication to launch will be in the treatment of RCC patients followed by the largest indication, NSCLC. We have modelled sales by Immunicum’s partner in all indications with RCC and NSCLC representing 25% and 35% of our rNPV valuation based on peak sales (on which royalties and milestones are based) of $1.4bn and $2.3bn, respectively. We have assumed one partner licenses all the indications with a single up-front payment at the end of 2019 on the release of the data from Immunicum’s clinical studies in that year. Multiple transactions with different partners would represent upside to our valuation. We recognise the up-front, milestones and royalties for valuation purposes but do not recognise them as revenue until the transaction is signed. This excludes the considerable cash flows of the anticipated licensing transaction from our model of Immunicum’s income statement and balance sheet. To compensate for not recognising these cash flows in Immunicum’s financials, we have included a SEK50m non-interest-bearing debt financing at the end of 2020. Immunicum recently reported its interim Q118 financials. The reported operating loss increased to SEK28.8m from SEK20.5m in Q117, and was SEK80.7m for FY17. This reflected Immunicum’s increased clinical trial spend as it moved through Phase II studies. Immunicum finished Q118 with SEK168.1m in cash (SEK84m at the end of Q117) and we anticipate the company to be funded through the two 2019 clinical trial read-outs, which we expect will result in a partnering transaction. With 94 patients treated to date in a range of clinical studies, the usual risks associated with clinical development still apply. The data reported to date have suggested that ilixadencel is well tolerated with the safety profile in oncology patients appearing to be acceptable. The efficacy measures, although immature, have been promising with three metastatic RCC patients surviving for at least 50 months after treatment, whereas high-risk and intermediate-risk patients have historical median survival times of 9.0 months and 16.2 months, respectively. Immunicum’s strategy is to develop ilixadencel to the point in RCC (end of Phase II) and at least one of the solid tumour indications in the multi-indication trial (interim analysis of the Phase I/II study) that will enable a partner to license, develop and commercialise ilixadencel. The company’s long-term strategy is to have partners commercialise ilixadencel in several solid tumour indications in combination with different standard treatments. For the purposes of our model, we have assumed Immunicum will be responsible for all the costs of the current and planned studies until the end of 2019, when we anticipate a licensing transaction that will transform Immunicum’s investment proposition. Our model forecasts the future sales in the five indications in order for us to calculate a 5% royalty on total sales. We have assumed one licensing transaction with one up-front payment from one partner, and then milestones and royalties on the five separate indications with sales milestones being triggered as the hurdles are met. The establishment of the CPIs as blockbuster commercial products by big pharmaceutical companies BMS, Merck, Pfizer, AstraZeneca and Roche has brought its own problems that could be solved by combination use with other agents acting at a different part of the cancer immunity cycle. Immunicum’s ilixadencel is one of these options. The recent failure of Merck and Incyte’s Phase III study of Keytruda and Incyte’s IDO1 (indoleamine 2,3-dioxygenase) inhibitor highlights the continuing need not just for cancer immunity cycle-active agents that would be complementary to the CPIs, but for different mechanisms of action that a small molecule with modest single-agent activity seems to be unable to provide. The licensing of ilixadencel, whether it comes before 2019’s impending clinical trials, could result in a significant rebasing of Immunicum's valuation. Ilixadencel is being tested in Phase I and II clinical trials, in several solid tumour indications and combinations (see Exhibit 1). The most advanced programme is in RCC, where ilixadencel is being tested in Phase II (MERECA study) in combination with Pfizer’s approved TKI sunitinib. Recruitment in this trial was completed in early January 2018. The other key study is the Phase I/II in multiple solid tumour indications (patients having NSCLC, HNSCC or gastrointestinal adenocarcinoma) in combination with a CPI. We believe it will be either Bristol-Myers Squibb’s (BMS’s) Opdivo (nivolumab) or Merck & Co’s Keytruda (pembrolizumab). Immunicum is also conducting a Phase I study in gastrointestinal stromal tumours (GIST) with the relevant TKIs in second or later lines of therapy. GIST is a small indication and is not central to Immunicum’s strategy. The company expects RCC Phase II data as well as multi-indication interim Phase I/II data in 2019. At that point Immunicum will seek to partner ilixadencel and there is expected to be enough information to choose the lead indication(s) and combination(s) to take forward into pivotal Phase III clinical studies (see Exhibit 2 for study designs). The RCC Phase II sample size is not powered to show statistically significant overall survival benefit, but could show a compelling clinically relevant advantage over sunitinib. The primary endpoints for the study are median overall survival and median survival at 18 months. Overall, 88 newly diagnosed mRCC patients have been enrolled in the study. ilixadencel in another solid tumour indication (NSCLC, head and neck cancer, or gastrointestinal adenocarcinoma) together with the CPI used in the multi-indication trial. We have assumed that the RCC Phase III will be Immunicum’s first Phase III study (conducted by its partner and starting in 2020) and will be closely followed by the start of the NSCLC Phase III (the largest indication) also by Immunicum’s partner in 2020. We expect Phase III studies in other indications that are commercially significant but not as large as NSCLC to start in 2021 (HNSCC and gastric adenocarcinoma) and 2022 (HCC). Study ongoing (started H115, all patients enrolled). n=88; open-label, randomized, controlled, multi-centre Phase II exploratory trial evaluating safety and efficacy of intratumourally administered ilixadencel (1L) pre-nephrectomy followed by sunitinib post-nephrectomy (2L), compared to surgery and sunitinib post-nephrectomy in newly diagnosed mRCC patients; 2:1 randomization (ilixadencel + sunitinib: sunitinib); patients stratified into intermediate and high risk group according to the Heng criteria. Primary endpoint – OS from randomisation overall and by subgroup (high-risk and intermediate-risk groups), and OS at 18 months overall and by subgroup. Secondary endpoints – safety (frequency and proportion of AEs), PFS, objective response rate from start of sunitinib treatment and duration of response (RECIST v1.1), TTP from start of sunitinib treatment, CD8+ tumour infiltration. Study sites in EU (EudraCT No. 2014-004510-28) (Sweden, Poland, Hungary, Czech Republic, Latvia, Spain, France and UK) and US (IND17081). Top- line data expected Q319 (note that the study sample size is not sufficient to show statistically significant difference in OS between the two groups, but aims to identify clinical meaningful differences in primary and secondary endpoints). Study to start in H218. n=TBC; open-label, randomised, multi-centre Phase Ib/II trial evaluating the efficacy and safety of intratumourally administered ilixadencel in combination with a CPI in advanced cancer subjects that are candidates for CPI therapy (1L/2L); two-stage design (Phase Ib followed by Phase II parts). Phase Ib primary endpoints – safety (frequency and severity of AEs), recommended Phase II dose and schedule; secondary endpoints – response rate, response duration and immunological anti-tumour response. Phase II primary endpoint – objective response rate; secondary endpoints – safety, objective tumour response rate and duration of response (iRECIST), TTP, PFS, OS and immunological anti-tumour response. Study sites in US (TBC). Source: Edison Investment Research, Immunicum. Notes: TKI = tyrosine kinase inhibitor; CPI = checkpoint inhibitor; 1L = first-line treatment; 2L = second-line treatment; mRCC = metastatic renal cell carcinoma; OS = overall survival; AEs = adverse events; PFS = progression-free survival; TTP = time to disease progression. Ilixadencel is an immune primer made up of pro-inflammatory activated allogeneic DCs. When injected into a different patient, these DCs do not fulfil their traditional role, which is to directly prime T-cells in the lymph nodes. Several other unrelated immune priming strategies make use of DCs and are known as DC vaccines. The key difference between ilixadencel and DC vaccines is that ilixadencel DCs are allogeneic (isolated from healthy donors) and are pro-inflammatory (produce an artificially large amount of chemokines and cytokines) in a different patient in their own right. So although not containing any tumour-specific antigens, their mere presence (and death) in a tumour results in an immunological anti-tumour ‘bystander’ effect against the tumour. Immunicum has demonstrated that its DCs have an immune priming effect when delivered intra-tumourally. Mechanistically this is achieved when ilixadencel promotes the recruitment and activation of the patients’ own (endogenous) natural killer (NK) cells and DCs that capture tumour antigens released at the same site within the tumour into which, ilixadencel was injected. Ilixadencel subsequently leads to a systemic therapeutic effect as the immune system becomes primed to those tumour antigens. This effect would be enhanced when ilixadencel is combined with certain TKIs or CPIs. In addition, Immunicum has data in one patient demonstrating that this systemic activity generated against a primary tumour was confirmed with anti-tumour effects against a metastatic tumour. In a malignant process, cancer cells die and proteins/antigens are released including abnormal, ‘non-self’ mutation-derived ‘neoantigens’, which are cancer specific (step 1 in Exhibit 3). These are then taken up by the patient’s own antigen presenting cells, or DCs and in lymph nodes they present these antigens to T-cells (step 2). This leads to an activation and production of populations of T-cells, which can now recognise and destroy cancerous cells that display the same antigens as those previously presented (steps 3 to 7). This process is not perfect, which is why not every malignant process is stopped. Once a tumour develops, it often also has multiple ways to suppress the immune response and enable the tumour to ‘hide’ from the immune cells. The goal of cancer immunotherapies such as Immunicum’s ilixadencel is to expose the tumour microenvironment as non-self to the patient’s immune system so the tumour is recognised and immunologically attacked. Source: Based on research by Chen and Mellman. DCs are isolated from healthy donors. The allogeneic DCs are treated to become activated or pro-inflammatory and produce large amounts of immune-stimulating chemokines and cytokines, which promote host immune cell recruitment and activation in the patient. The allogeneic DCs are injected into the viable (non-necrotic) part of the patient’s tumour. The injected DCs release the immune-stimulating factors into the tumour, causing local recruitment and activation of the patients’ immature DCs, natural killer (NK) cells and T-cells. The recognition of the injected DCs by the immune system as foreign (to the patient or host) also helps this process. Activated NK cells kill local tumour cells, which release neoantigens locally. The patient’s activated DCs migrate to the tumour site, pick up neoantigens and express them on the cell surface, and then travel to the lymph node. In the lymph node, activated patient DCs expressing neoantigens ‘present’ these neoantigens to patient CD8+ cells, which become cytotoxic CD8+ cells that are able to kill tumour cells. Ilixadencel was found to be safe and well tolerated. All AEs were mild to moderate and were fever (five patients), chills (two patients), rash (one patient) and hypotension (one patient). No dose-limiting toxicity was found, SAEs were reported but were unrelated to ilixadencel and there were no signs of autoimmune response. We find the side effect profile encouraging and suggestive that a transformation of the immune response to the tumour was in progress. Of the three patients who subsequently received sunitinib, two showed an objective tumour response. Their CD8 response was evaluated before initiation of sunitinib treatment and responses were seen in patients who received other TKIs. The data are summarised in Exhibit 5 and the patients were treated differently following treatment with ilixadencel, so the efficacy that was observed could have been also due to these treatments, or could have been due to the combination. However, median time to the start of additional systemic treatment was delayed as compared to the standard schedule and taken together with the surprising efficacy in metastatic CNS and sarcomatoid tumours, this data indicated that the pace of tumour progression had slowed. Immunicum is pursuing a recently emerging strategy to exploit complementary mechanisms of action of drugs targeting different points in the immunity cycle (see Exhibit 3). This is because the success of the first- and second-generation CPIs has brought with it additional challenges. When patients are treated with anti-PD-1 monoclonal antibodies like Keytruda or Opdivo, for example, not all patients respond because of the heterogeneity PD-1 expression on their tumour cells either at the time of therapy, or after a number of cycles. Poor response rates have been demonstrated in patients with NSCLC whose tumours have low PD-1 expression because the majority of the tumour escapes the targeted treatment. This is why more traditional chemotherapeutic drugs are used in combination with CPIs either to hit the tumours at different targets or to maintain anti-tumour activity when the tumour attempts to escape the host immunity by up-regulating PD-1/L1. The most recent data on Merck’s Keytruda in first-line NSCLC used the CPI as monotherapy. In the medium term, CPI monotherapy could create a large market for second-line therapies from a bolus of CPI monotherapy-relapsed patients. Second-line therapy would then contain a CPI and a next-generation immune-priming enhancer of CPI activity, like ilixadencel. Having built on the early success of the PD-1s, big pharmaceutical companies have been very active in licensing products that could be active within the cancer immunity cycle but at different, hopefully synergistic points than PD-1/L1 inhibition. Ilixadencel could be one of these CPI enhancers. Ilixadencel targets the first stage of the cycle which prepares the immune system to attack the tumour. CPIs, and possibly also TKIs, target the last stage of the cycle and inhibit the tumour’s immune suppression mechanisms (‘releasing the brakes’). Combining these two mechanisms should improve clinical responses in patients by improving the immune system’s ability to attack and kill tumour cells. CPIs have gained popularity over the past several years because of the additional clinical benefit over standard-of-care cancer treatments. However, a large proportion of patients do not respond to these treatments. One suggestion for this effect is that a non-responders’ immune system is not efficient at carrying out steps 1 to 6. Therefore, a popular new approach has been to combine CPIs with therapies targeting steps 1 to 6 of the cycle, such as ilixadencel. TKIs: there is some evidence that TKIs may also ‘release the brakes’ (as might sunitinib) and could also be combined with immune primers to increase the clinical response. ‘Off-the-shelf’ vaccines (not personalised) contain both immune primers and tumour-associated self-antigens in the form of synthetic long peptides, RNA or DNA, and are not based on the patient’s own tumour. Compared to personalised vaccines they can be easier to manufacture, store and ship. The product should be simple to administer, which should result in a higher compliance and reduced infection risk because no tumour biopsy is required. However, the identification of suitable neoantigens that are conserved and expressed in the majority of patients is a significant challenge, especially due to patient-to-patient, and even intra-tumoural variation. The most clinically advanced example in this category is Tepodi (OSE Immunotherapeutics), which is being tested in Phase III for NSCLC. Immunicum’s IMM-2 platform is also in this category – its vaccine contains allogeneic DCs that are transfected with adenovirus containing the gene-encoding selected neoantigens – and is injected subcutaneously.Personalised vaccines. These are developed from the patient’s own tissues and contain patient-specific neoantigens plus an immune primer. DCs can be isolated from the patient and modified ex vivo to express neoantigens from the patient’s own tumour and administered back to the patient. Although apparently solving the problem of neoantigen variation between patients, personalised vaccines have other significant issues. The procedures can be complicated, expensive, time consuming and can expose the patient to infection. Provenge (Dendreon/Sanpower) contains prostate-specific antigen, which is a tumour-associated self-antigen, not a neoantigen and has not been commercially successful. Because autologous DCs are used as the primer/adjuvant, this concept, although the most widely recognised cancer vaccine, does not easily fit into any of the three groups here, and is unrelated to Immunicum’s DC technology. ‘Off-the-shelf’ primers are immune primers that become personalised vaccines when injected into the patients’ tumour. These vaccines offer a potential compromise between the first two approaches. They are personalised in that they exploit the patient’s own tumour neoantigen release by inducing tumour cell death, and are also ‘off the shelf’. Indeed, on an apocryphal level, it is generally accepted that patients who have hot tumours as a result of an immune response have better outcomes than patients with cold tumours. Only some patients have hot tumours, possibly due to the recognition of their own neoantigens. Such treatments are likely to be much safer for the patient and have a more convenient administration than personalised vaccines, especially in solid tumours. This is because the only procedure involved is the administration rather than the requirement in personalised vaccines for blood samples, tumour biopsies and the delays associated with amplification and release testing. Off-the-shelf vaccines could also be cheaper to produce because there is no need to first identify the optimal neoantigens or carry out genome sequencing on the patient’s tumour. There is also less of an issue with neoantigen variation. Oncolytic virus vaccines are in this category (Amgen’s Imlygic is the only marketed therapy). Immunicum’s ilixadencel also belongs to this category. Exhibit 6 shows ilixadencel’s competitive landscape. Ilixadencel’s competitive advantage is that it targets the solid tumour neoantigens that are specific to the patient and it is being tested in combination with a TKIs or CPIs. Source: Edison Investment Research, EvaluatePharma. Note: - denotes not currently tested. Immunicum’s positioning of ilixadencel is as a first-line treatment for advanced solid tumours in combination with standard treatments (for example in RCC, where sunitinib is the standard of care). Ilixadencel appears to be a typical neoadjuvant opportunity that could be applied to many solid tumours as it can be injected into any primary or secondary solid tumour above 2cm in diameter prior to surgical excision. Activity against metastatic tumours relies on the assumption that a reasonable proportion of patients will have a liver metastasis (which is not unreasonable) and that enough of the tumour neoantigens are conserved between the primary and secondary tumours. This enables the CD8+ cells to attack the primary tumour if they are ‘primed’ to the metastasis and vice versa. The market potential of ilixadencel will ultimately depend on its efficacy demonstrated in clinical trials, although with a number of IO adjunctive agents like Bavarian Nordic’s Prostvac and Incyte’s epacadostat both failing in Phase III, combination studies with Keytruda and Opdivo respectively, the barrier for a combination to show increased clinical activity is not high. An advantage of ilixadencel over Prostvac and epacadostat is that ilixadencel has demonstrated single-agent activity, albeit at an early stage. The need for new adjunctive IO agents and the low clinical bar was demonstrated by the FDA’s approval of Amgen’s Imlygic in unresectable melanoma on the basis of a single open-label Phase III study that did not demonstrate an overall survival benefit or have an effect on metastases. Although ilixadencel could be applied to a range of solid tumours, Immunicum is starting in solid tumours chosen partly on the basis of unmet medical need and partly on the accessibility of tumour for injection. Targets each step required for immune priming: to achieve an immune priming effect, the following events are believed to be required: recruitment of patient DCs and patient NK cells into the tumour, activation of patient NK cells, tumour cell death and activation of patient DCs. Ilixadencel is expected to target all of these steps. Personalised: because ilixadencel is effectively using the patient’s own tumour neoantigens, it could be positioned as a personalised therapy or at least, result in personalised activity. ‘Off the shelf’: because the cells are allogeneic, the vaccine does not have to be prepared for each patient, can be produced at scale, cryopreserved and stored until use (it can currently be stored for 36 months), see Exhibit 4. Potential for higher margins: Immunicum expects ilixadencel to be simple and cheaper to manufacture compared with other cell therapies (such as Provenge or the CAR-Ts), because it uses off-the-shelf materials. Ilixadencel could therefore have high gross margins. In our model, we have considered the price of the CPIs (which are between $100,000 and $150,000 gross in the US) and Amgen’s Imlygic (which is about $60,000 gross in the US) and have conservatively estimated ilixadencel at $75,000 net in the US and $37,500 in Europe. Because ilixadencel is a cellular therapy, we do not assume any gross-to-net price erosion over the forecast horizon. The company’s other technology platforms include IMM-2, an off-the-shelf vaccine in which allogeneic dendritic cells are pre-loaded with selected neoantigens through a proprietary adenovirus vector, and IMM-3, a proprietary method for expanding T-cells, which could be applied to CAR-T products. Both platforms are currently being tested in preclinical studies in academic collaborations. Ilixadencel has yet to reach a definitive proof-of-concept clinical stage so has significant risk. The most advanced clinical programmes are all testing the same drug (admittedly in different solid tumours), which is ilixadencel. If ilixadencel fails in one indication, the company only has earlier-stage indications and assets on which to focus. In Phase I studies the treatment was shown to be safe and well tolerated but, as with any treatment, there may be other AEs demonstrated in future trials. In addition, some demonstrated side-effect profiles tend to give investors evidence that the patients’ immune system is being stimulated. For example, a side effect of the TKIs is a rash, which can be severe, but is associated with better patient responses. Indeed, in the first-generation TKIs, oncologists would determine the dose by a ‘treat to rash’ regimen. Other agents such as small molecules and oncolytic viruses have demonstrated clinical utility in enhancing CPI IO activity so theoretically an allogeneic DC intra-tumoural injection with the release of a multitude of pro-inflammatory components should work better than the other agents used to date. It is unlikely that the administration procedure is too difficult for physicians other than radiologists to perform since intra-tumourally injected products are already marketed. CT or ultrasound is required to guide the injection to the viable part of the tumour. Radiologists are used to conducting similar procedures in, for example liver biopsies, but it is not known whether radiologists or radiation oncologists will be performing every procedure and some tumours will be more difficult to access than others. This may not limit peak market uptake, but could lead to some delayed penetration, at least until the procedures for ilixadencel become established. It will be difficult to apply ilixadencel to every solid tumour, especially in solid tumours where the tumour cannot be located. This may limit ilixadencel’s market potential unless activity against distal secondary tumours is demonstrated after injection into an accessible tumour. Immunicum suggests that for hard-to-reach tumours it may be possible to inject liver metastases, but this relies on a sufficient number of patients having a liver tumour metastasis (which is not unreasonable) as well as neoantigen conservation between primary and secondary tumours. The addressable population may be somewhat limited by the tumour size, since ilixadencel should only be injected into tumours greater than 1cm in diameter although this did not prevent the FDA approval of Amgen’s intra-tumourally injected product Imlygic. By the time ilixadencel is launched, the treatment landscape and ‘standard treatments’ are likely to have developed. For example, sunitinib alone may not be the standard of care in RCC, in which case Immunicum’s partner may have to conduct additional combination studies than currently planned to be a component of combination therapy. Immunicum could have been associated with previous failures in the immune priming space, including other DC approaches. This could make the company seem less attractive to investors and potential partners unless it can sufficiently differentiate itself and show efficacy in clinical trials. However, since ilixadencel is a new product with a different mechanism of action, its success will depend on its intrinsic clinical activity, rather a lack of clinical activity in other unrelated agents and combinations. We believe that Immunicum is funded through 2019 with significant newsflow during that year and expect a partnering transaction at that point. The terms of the transaction will depend on clinical trial results, market conditions and partnering progress. In lieu of the transaction, we have included a modest SEK50m debt funding to simulate a portion of the potential transaction value. Immunicum is an oncology company devoted to drug discovery and development, so it will be loss making for the immediate future. Immunicum announced its Q1 interim results with an operating and net loss of SEK28.77m compared to SEK20.53m in Q117 (EPS loss of SEK0.6 vs a loss of SEK3.1 in Q117). As would be expected for a R&D company, clinical trial costs and the cost of the infrastructure allowing clinical trials to be conducted comprised most of Immunicum’s expense. R&D costs were SEK22.2m (SEK14.0 in Q117) while administrative costs were SEK6.0m vs SEK6.6m in Q117. R&D expenditure is expected to increase in 2018 due to the initiation of the multi-indication Phase I/II trial. Immunicum completed a two-part rights issue in December 2017 and January 2018, raising SEK200m in total gross proceeds (SEK167.5m net). Following the raise, the end of Q118 cash position was SEK168.1m. Our valuation model anticipates ilixadencel to be partnered. The forecasts in our financial statements simulate a portion of this transaction by an illustrative SEK50m debt fundraising in 2020 after the Phase IIa RCC study and interim results from the multi-indication study. Depending on the terms of the transaction, Immunicum could choose to retain a larger proportion of the future upside of ilixadencel in exchange for some of the late-stage development. Our risk-adjusted NPV valuation of Immunicum is SEK1.13bn or SEK22.1 per share, which compares to the current market capitalisation of SEK324m or SEK6.59 per share. The components of our rNPV are outlined in Exhibit 8. Our model is based on the epidemiological and financial characteristics outlined in Exhibit 7. We assume that ilixadencel is partnered on the basis of the results of the two clinical studies that report in 2019. 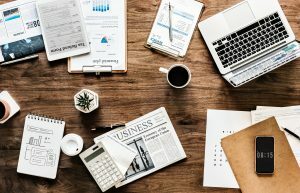 Because we only recognise up-front, milestone and royalty payments when a contract is signed we have included a SEK50m debt financing in our financial statement forecasts to compensate for a small portion of these cash flows not passing through Immunicum’s financial statements at the end of 2020. The forecast horizon on which our valuation is based runs to 2033. 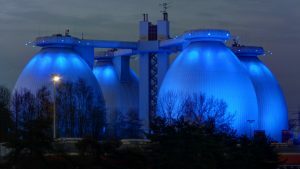 This is 10 years after the Combig production method patent expires in Europe and two years after the 2031 assumption of the latest ilixadencel patent expiry. This two-year period would cover any stretch of formal or informal market exclusivity which can be up to ten years in Europe. We have not modelled an extra period of paediatric exclusivity. The period of exclusivity of cellular therapies is, however, opaque. 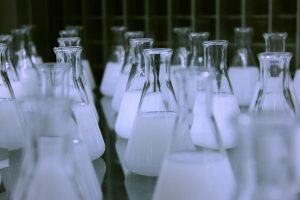 On the plus side, it would be more difficult for a company wanting to launch a biosimilar to ilixadencel to access data on the product within the exclusivity period. In addition, because ilixadencel is an ‘off-the-shelf’ therapy but manufactured by Immunicum or its partner, comparative clinical studies could theoretically be performed, but may be difficult without Immunicum’s consent. Our rNPV valuation model assumes that RCC is the most advanced indication and all subsequent indications progress through the cascade of clinical and regulatory timings outlined in Exhibit 8. We have assumed 2.3% market shares at launch and 15% peak market shares for all indications except for NSCLC which, while being the largest indication, is the most competitive and we assume 10% peak market share in NSCLC. We have used a probability-adjustment of royalties and milestones due to Immunicum of 15% for all indications except HCC, which is currently in Phase I. Our model forecasts sales in all five indications but the cash flows to Immunicum are based on the schedule of a single up-front payment, then royalties and milestones that are dependent on the hurdles listed in Exhibit 10. The median up-front payment in 10 Phase I/II IO transactions in Exhibit 12 was $98m – we have used $100m. The median value of milestones for the 10 transactions was $606m. We have reduced the total value in the schedule in Exhibit 9 to $160m because almost all transactions include a clinical trial funding component from the licensor, and to reflect the transaction probability risk, which will be reduced when Immunicum signs its first deal. We assume a 5% royalty on sales which are also probability-adjusted. We assume that all clinical development and marketing costs beyond 2019 will be paid by Immunicum’s partner, while any general corporate costs outside the clinical costs not included in the rNPV for each product are grouped as unallocated costs. We stagger by a year the launches for all products in the EU behind those in the US (both markets contribute to the total sales on which 5% royalties are calculated). Oncology patients in later lines of therapy and their physicians are highly motivated to complete even salvage therapy so we have assumed 100% compliance for all patients treated with ilixadencel. For the incidence of NSCLC, unlike all other indications, we forecasted a 2% decrease in the patient population because of the decline in tobacco consumption in developed markets. To sense-check our DCF, we have compared Immunicum’s EV against other oncology companies that have IO products in Phase II. We have also benchmarked what an IO product licensed after Phase I could imply to Immunicum’s valuation. It could be debated that Immunicum’s immune-priming platform in oncology was recently validated by Merck’s $394m (SEK3.3bn) acquisition of Australia’s Viralytics, which also has a product injected intratumourally, and is in Phase I and II studies. Viralytics’ approach, like Immunicum’s is to engage the innate immune system to target and kill tumours by complementing the IO activity of a CPI. We have included Viralytics with five other US companies in an oncology comparison in Exhibit 11 below. US companies have a greater access to capital and thus their valuations are almost always higher than similar European companies. We have included two US oncology specialists at a similar stage to Immunicum, but both have histories of late-stage clinical and regulatory failures. We have included two other recent transactions in the CAR-T cellular IO space in Exhibit 8 because they are closer to Immunicum’s technology than small molecule oncology companies, but only to conclude that cellular-based, IO therapies such as ilixadencel are in demand in 2018. The demand for IO-enhancing therapies was recently demonstrated by BMS’s licensing of Nektar Therapeutics’ Phase I/II IO product NKTR-214 for $1.85bn (SEK15.3bn) upfront in a total deal worth about $3.6bn (SEK29.7bn). NKTR-214 is a PEGylated recombinant interleukin-2 that showed interesting recent data in combination with BMS’s CPI in a handful of patients in each tumour type in a mixed Phase I/II study. Like Immunicum’s DCs, NKTR-214 is proposed to act synergistically with CPIs at a different part of the cancer immunity cycle. Source: Bloomberg, company websites Note: Priced at 31 May 2018. We have focused more on European companies with oncology products at a similar stage of development to Immunicum. For example, Transgene has three products in eight Phase II studies, one Phase III for one of those products and one non-oncology product in Phase I. Transgene’s market capitalisation of SEK1.9bn is significantly higher than Immunicum’s (and our rNPV valuation of Immunicum), possibly because of its collaborations with BMS and Pfizer. The recent BMS/Nektar deal and Transgene’s much larger market capitalisation than Immunicum illustrate how much a partnership based on positive data could mean to Immunicum. Germany's Medigene has one Phase II product and has market capitalisation of SEK3.6bn. Geographically closer to Immunicum, Norway's Targovax is an IO company with one product in Phase II and four Phase I studies, three of which are with the same product. Targovax has a market capitalisation of SEK1.0bn. Of the 10 comparator companies in Exhibit 11, only Targovax has a market capitalisation lower than our valuation of Immunicum. Sweden's Oncopeptides illustrates the valuation generation that could be associated with a successful outcome from one of Immunicum's Phase II studies, since Oncoeptides' unpartnered lead and only product – an enhanced chemotherapeutic agent rather than a cellular IO agent – started a Phase III study in June 2017. Oncopeptides’ market capitalisation is SEK5.4bn. Exhibit 12 lists the most recent IO transactions that occurred after the products were in Phase I. The products included must have some IO component – they are either CPIs, or have been studied in combination with CPIs. This provides supporting evidence that our risk-adjusted NPV valuation of SEK1.13bn ($128m) may be fair because none of the 10 transactions was value of the milestones alone, less than our DCF valuation of Immunicum. It is fair to say the table represents successful transactions and Immunicum has not yet demonstrated that success, so some risk-adjustment on a median value may be appropriate. In comparison to US and most European IO companies, Immunicum’ market capitalisation is lower than any of the 10 companies in Exhibit 10. In addition, our rNPV is lower than all but one of the market capitalisations of IO companies in Exhibit 11. In the 10 examples of recent transactions for IO products since 2015, none of the transaction values was less than our SEK1.13bn risk-adjusted NPV valuation of Immunicum. In addition, the median value of the upfront payments alone (to remove outliers like Nektar) is $98m or about twice Immunicum’s current market capitalisation. 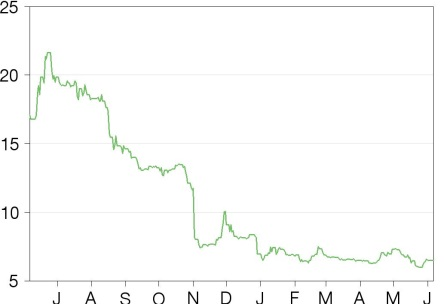 The reason for the difference between Immunicum’s market capitalisation and our valuation could be because of the significant shareholder turnover after the rights issue together with the market volatility since late January. At least that last hurdle has now passed. Another reason for the difference in valuations between other European IO companies could be that Immunicum listed recently and, being so late in the cycle, it may have a low profile among investors. In addition, there could be investor scepticism associated with other unrelated DC products such as Provenge, despite Immunicum’s product having significantly different characteristics and mechanisms of action. Carlos de Sousa is a medical doctor by training, having earned his degree at the School of Medicine, University of Lisbon, and holds an Executive MBA from the Stern School of Business, New York University. He has more than 25 years of senior-level experience in the global pharmaceutical and biotech industry, including business development, mergers & acquisitions, global marketing and clinical development. Before joining Immunicum, he held senior positions at Nycomed/Takeda, Pfizer, Novartis, BBB Therapeutics, Newron Pharmaceuticals and, most recently, was chief business officer at Zealand Pharma in Denmark. Michaela Gertz holds an MSc in business and economics from Uppsala University including a course of study at the Katholieke Universiteit in Leuven, Belgium. Most recently she was CFO and investor relations manager at PledPharma, a drug development company based in Stockholm. She was instrumental in PledPharma’s IPO in 2011 and subsequent fund-raising efforts. Prior to that, Ms Gertz spent three years as head of investor relations and financing at Accelerator Nordic. Before joining the life sciences industry, she worked in finance and private equity at ITP Invest and Handelsbanken. Adjunct Professor Karlsson-Parra has over 20 years’ experience working in the field of transplantation immunology and is former chairman of the Swedish Expert Group for Clinical Immunology. He was awarded the Athena Prize, Swedish healthcare’s most prestigious award for clinical research, in 2014. He was formerly Associate Professor and chief physician at the Department of Clinical Immunology at Sahlgrenska University Hospital, Gothenburg. Peter Suenaert is a gastroenterologist- oncologist by training (Leuven University, Belgium, McGill University, Canada, Institute Gustave-Roussy, France) and holds a PhD in gut barrier function related to inflammatory bowel diseases from Leuven University. Before joining Immunicum, he served as global clinical programme lead for the oncology unit (immune oncology assets) from start-up stage to fully operational Phase I/II protocol development. Dr Suenaert has held several leading positions in global clinical development and research including clinical research development leader in global early cancer immunotherapeutics development at GlaxoSmithKline Vaccines in Belgium.